Troon is an easy to enter harbour that sees some ferry traffic, cargo traffic, and fishing boat activity. The Marina formed in the inner harbour, offers very good shelter plus full marina facilities, including fuel alongside. (A bit of a rarity on this part of the coast, worth filling up if you are heading south). All normal town facilities are on hand for the crew, including good transport connections. For the yacht, full boatyard and specialist services are available. .... but big seas can build up with strong SW winds. Lamlash Harbour on Arran is easy to enter in these conditions, but offers little in the way of facilities. Alternatively to the North, Largs has protection from the SW in the approaches. If approaching Troon from the North there are various off lying dangers including Lappock Rock, and Mill Rock that can be cleared by staying outside of the 20 m line, with the run in to the harbour commencing when entrance bears SE. Troon Rock, with 5.6m depth clearance lays about a mile to the west of the harbour entrance, it is unmarked, and in heavy weather the sea breaks on it. Avoid in strong onshore conditions. If approaching from the South (Ayr Bay), Lady Isle is conspicuous enough and marked with a lighthouse (Fl.2s19m11M). Shallows and reefs surround this island, especially to the north-east of it. Troon Rock has already been mentioned as a place to avoid in heavy weather, and in the closer approach to the harbour mouth, Crab Rock, laying a couple of hundred metres to the west of Troon West Pier, is marked by a green conical buoy (Fl.G.4s). At night Crab Rock is covered by the green sector of the light situated at the end of West Pier, do not commence the closer approach until past the green conical buoy, and only when you are within the white sector of the pier head light. 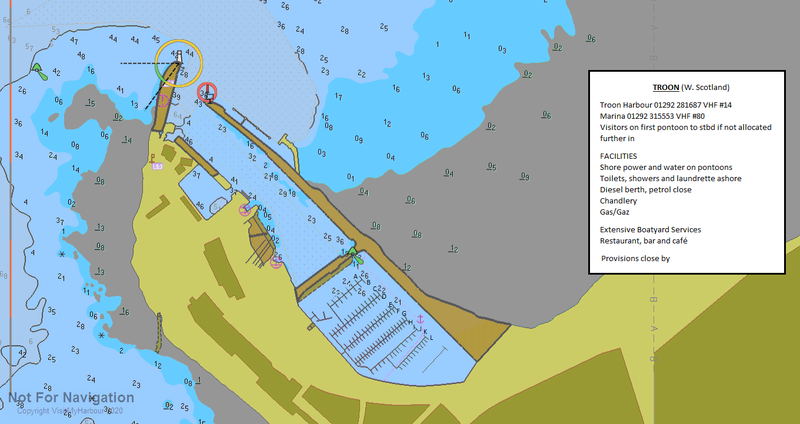 (Fl(2)WG.5s.11m9m) The Green Sector of that light is the "danger zone"
In all cases it makes more sense to approach the harbour when the entrance is bearing SE from a reasonable distance off... this gives you a chance to see what is emerging. Keep on VHF channel 14 for vessel movements, which can include high-speed ferries. The P & O Ferry from Troon to Larne has closed and the fight for the Arran Ferry has been lost so that remains at Ardrossan up the road. Traffic signals consist of a VQ Flashing light displayed from the West Pier (but not at the end). This signifies a ferry is about to leave. Other traffic signals consist of two black balls arranged vertically on a mast, (2F.R. (vert) displayed at night) mean the harbour is closed. Once within the outer harbour make for the marina in the inner harbour, but be sure to leave the green conical buoy (QG) or on your starboard side as you pass through the narrow gap between the harbours. Troon yacht haven operates on VHF channel 80 (or 37), and it may be worth calling them up for advice before entering the outer harbour, especially if you're not sure about ferry movements. They have a very good aerial video of the way in at the link below; there is a preliminary bit about the Marina to start with and the approach starts at 30 secs in. Call the Marina on the above-mentioned VHF channels for allocation of a berth.Telephone 01292 315553, office open 24 hours. Alongside berthing is available on "A" pontoon for those who have not called in. This is the first pontoon on your starboard side as you enter. Visitors should report to the marina office at their earliest convenience. Absolutely all normal Marina facilities are available at Troon, water and electricity on the pontoons, showers and toilets and laundry ashore. Fuel is available alongside, and well worth stocking up on if heading south. Petrol is available at Morrisons which is not too far away; the marina was seriously investigating the provision of petrol but, in the end, the cost and bureaucracy mitigated against it!! Chandlery including Calor & Camping Gas is available on site, whilst just about everything else from marine electronics to engine servicing is on hand. The boatyard operated by the Marina handles the liftings, while the Marine tenants provide the specialist services. A bar/restaurant is on-site too..
Trailers sailers will find the Marina has a fine slipway available all state of the tide with plenty of room... there are charges. The town itself is a short walk away, and here you will find supermarkets (Morrisons), shops, banks and post office. Transport wise the town is served by a railway station on the Ayrshire coast line and the Glasgow south western line. Prestwick International airport is one stop away on the train, and offers international and national flights. It is a Ryan Air hub for cheap flights. Overall Troon is a good spot for crew changes. The name 'Troon' is derived from the Gaelic An t-Sron, meaning 'The Nose' or 'The bill' and a look at a map shows how it got this name. This could equally, however, have derived from Old Welsh. In various deeds, the spelling is given as "Trune", "Trone", "Truyn", and "Trwyn". Nevertheless, the Scots Gaelic etymology is consistent with that of Stranraer (located further south on the coast). Troon is famous for its Royal Troon golf course, one of the hosts to the Open Golf Championship. The course is chosen to host this annual event roughly every seven years. Troon Harbour played a notable part in the development of the town for many years. It was home to the Ailsa Shipbuilding Company, which constructed many vessels for worldwide customers but mainly small passenger and various merchant vessels. The fishing fleet from Ayr moved to Troon Harbour and a revitalisation of the abandoned section of the harbour started. An approach road was constructed to connect to a P&O terminal which operated a service to Ireland. The Seacat high speed ferry service to Northern Ireland no longer operates in the summer months. Troon Harbour is now a fishing port, yachting marina, seasonal passenger ferry port and Ro-Ro ferry terminal for timber and containers. The shipbuilding industry at Troon Harbour ended in 2000 . The town is served by Troon railway station. Troon has its own secondary school, Marr College. Troon is also the birthplace of C.K. Marr, who left a considerable fortune upon death to the people of Troon. Did you know that you can all join in ? Had a good experience at this harbour ? Staff helpful, prices reasonable, facilities good ? or maybe not ? Use the link directly under this to leave a comment, amendment or further information about this harbour. I reviewed these notes in April 2017. The rumoured relocation of the Arran Ferry here has been shelved so there are no scheduled ferries here at all. They have put their prices up. Troon to Larne ferry no longer operates. In Jan 2016 P&O terminated the service as not financially viable. Still need to watch out for fairly large Cargo ships and Barges (Wood) along with the fishing boat fleet. These notes were updated by Don in April 2015. The prices are correct for the 2015 season. Our hopes for petrol came to nought and it still has to be obtained from Morrisons.